GIS Tips – Using styles – AN UPDATE!! Last week I posted about the ArcGIS Style Management and how to improve consistency and said that QGIS wasn’t quite there….I was wrong…kind of…. I stand by my statement that the current version of QGIS is a little clunky BUT having seen these screenshots and images of what is coming in QGIS 2.0, I feel that ESRI might now be wondering how they can charge so much for their software. Many thanks to Anita Graser & Nathan Woodrow (from who I blatantly stole the following text) for their continued help with QGIS. 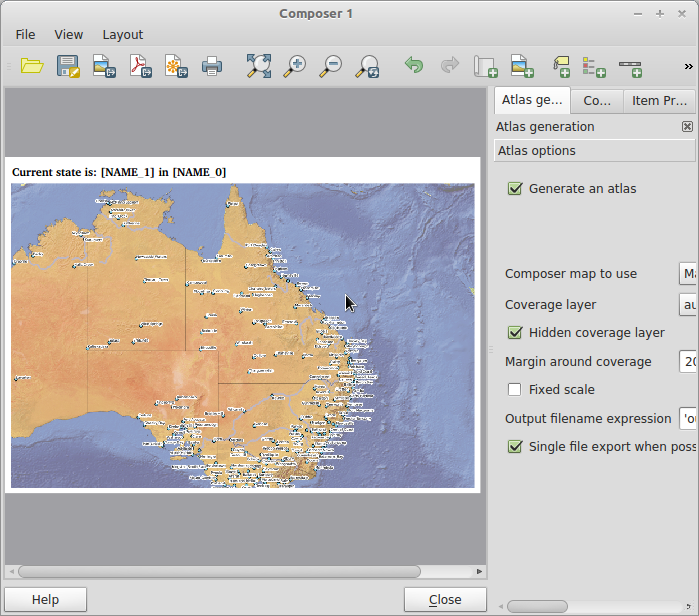 Recently there have been some great new additions to the QGIS project. Being part of such a fast moving project is a great feeling, and it’s only going to get better. This post is going to be a quick over view of some of the newer features that I really like. Well of course I like this one, I just added it. The reason I added this feature was because I really wanted to way to have popup images on the map canvas for flood damage reports on roads. I also wanted it dynamic so I could use template like syntax to replace values at run time. I’ll let you think of some nice use cases for this new addition. This new feature comes from Giuseppe Sucameli of faunalia with the work done for ARPA Piemonte. The task was to add Python macros that run when a project is open, saved, closed. As a side effect of the task the issue of security was raise and how to notify the user that macros are going to run. For me this was less about security and more about how to present that information to the user without annoying the crap out of them. Most of the time popup dialogs in software are a anti-pattern and are often abused for tasks like this. So knowing I would throw my computer out the window if I had to dismiss yet another dialog I suggested a less intrusive method being used a lot these days. The handy slide out notification bar. Giuseppe was very welcoming to the idea and implemented it nicely. I’m working on a patch to move this stuff into the notification bar just no ETA at the moment as I’m a bit busy. Larry Shaffer has been working on some great improvements to the new labeling engine in order to make our maps look a lot more professional. Larry has been doing a lot of work in this area and is still going so I’m not going to go into all the details. However one new labeling feature that I really like is the ability to to set the spacing between letters and words. There is also the new ability to set the transparency of the label and the buffer. The buffer transparency is something that I really like as sometimes you need a buffer but a solid buffer can then block out your map features; by adding a 45% transparent buffer I still have the labels pop off the map but not in your face or blocking features. It’s hard to make a picture to explain it well so you’ll just have to experiment. ~/.qgis/project_templates folder and the project will be shown in the file menu. And last but not least. This years GSoC student Arunmozhi got the improvements he had (has) been working on included into the master build. Arun was very welcoming to any feedback that Martin and I gave him about how we would like symbol stuff to work. Anita Graser has already covered a lot of the new features over on her blog so I’m not going to go over everything again, although one thing she didn’t really touch on was the smart groups and tagging. The tagging and smart groups are one of my favorite additions to the new symbol manager. As QGIS is such a fast moving project I have decided to make this a regular blog post in order to highlight some new features added to QGIS. If you haven’t already, don’t forget to check out round one. Remember that some of these features may still only be new which might change between now and the next official released version. With that out of the way lets get listing. If you are a regular user of QGIS Python plugins, and who isn’t, then you would have used the awesome Atlas plugin developed by Vincent Picavet. This great tool can be used to generate mapbooks, or an atlas as some people like to say, using a coverage layer and a print composer. What makes this even more awesome is that it is now built into the print composer. Big thanks to Oslandia for integrating this great feature, and the companies sponsoring the work. 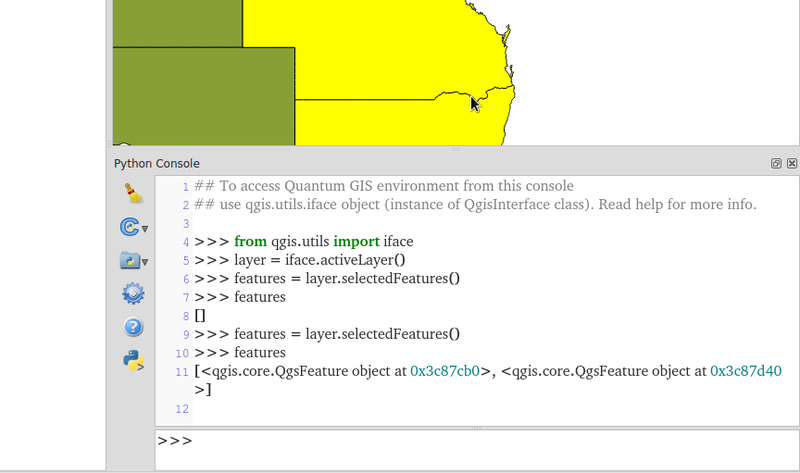 This new addition comes from the great work that Salvatore Larosa has been doing to add a better Python console to QGIS. The new Python console includes attribute auto complete, syntax highlighting, better copy and paste, uploading to codepad, the ability to run code from a file, etc. You don’t realise how much difference there is until you go back to using the old one in version 1.8. One of the things I really loved about QGIS, coming from MapInfo, was the builtin forms. Just having the ability to enter data using controls like combo boxes, calendar widgets, etc makes you one step closer to having better data. This feature is the exact reason I setup a 67 year old for kerb data collection. As good as they are the builtin forms have an issue of ending up with as a big scrolling list with lots of fields; also the lack of the ability to group or put fields on tabs in the UI meant you had to create a custom form. Well not any more. There is now a combo box on the Fields tab that allows you to build a generated form but also add tabs and group boxes. You can even have the same field shown more then once on the form, handy for something like an ID field that you would like to show on each tab. With this new ability the builtin forms can get me 95% of the way for data entry jobs, the other 5% I just make a custom form – but that is very rare. Sextante is a great and powerful analytical framework that has been added to the core of QGIS thanks to Victor Olaya. This is not a feature that I use a lot but this is only due to most of my work being in development and not analysis, however that doesn’t mean that it’s not a really cool feature. One of the greatest things about the Sextante toolbox is that it allows you to integrate other great open source tools like GRASS, SAGA, R, OTB, etc, right into your QGIS workflow and view the results in the canvas. It even includes a modeller so that you can build a connected diagram of all the bits of your process, even if it crosses between programs. For me what is even better is that you can use Sextante in your plugins or custom Python code. Sextante has a Python interface – well the whole thing is written in Python – that you can use to run a Sextante supported algorithm. A new loadFromTemplate method, in the API, that can do text replacement in the QGIS composer template. A huge thanks to the World Bank, Australia-Indonesia Facility for Disaster Reduction, Geoscience Australia and the GFDRR, and all the developers included. P.S The World Bank also sponsored the new raster Save As.. ability just like we have for vector layers. Special thanks again to Nathan Woodrow and Anita Graser for their continued support and development of QGIS.